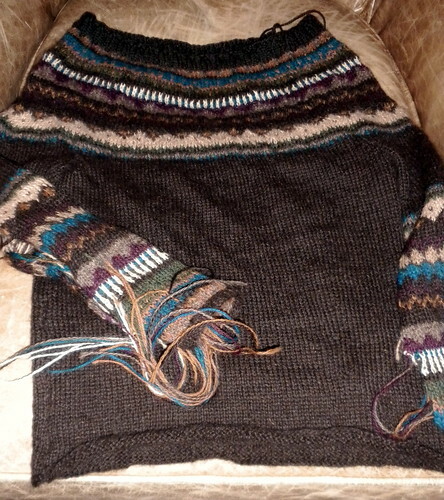 Look – it’s almost a sweater! I’ve been working on the Equinox Yoke Pullover lately because I want to wear it Saturday for our annual farmers market meeting. 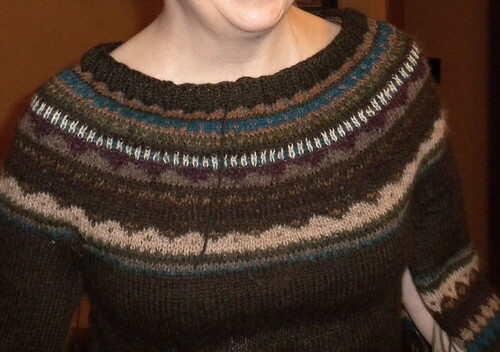 The dark brown main color yarn and all but four of the other colors in the yoke and sleeves are from my friend Lisa’s llama farm. Lisa is our market manager and all around good woman. The kind you admire and count yourself lucky to know. I think she’ll like finally seeing the sweater. I’ve been carting the yarn around for three years now. The other four colors (rust, purple, blue, and green – all alpaca) are vacation yarn from Paris. It’s going to be a great sweater. Damn I hope it fits well.